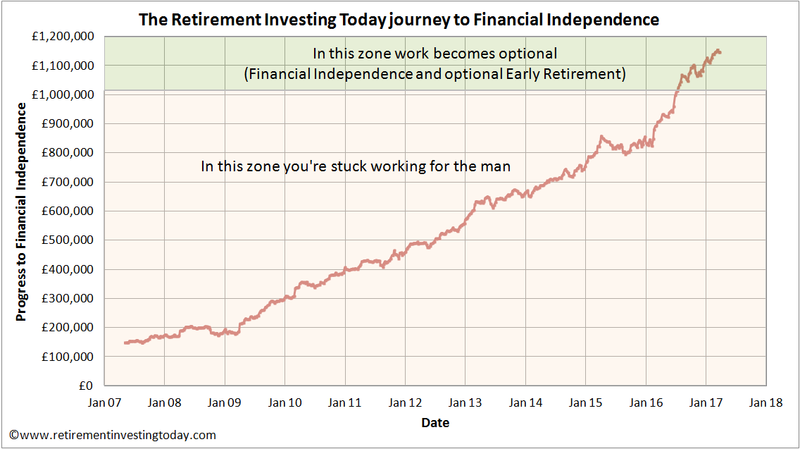 Over a lifetime of investing we’re going to see a lot of things happen. 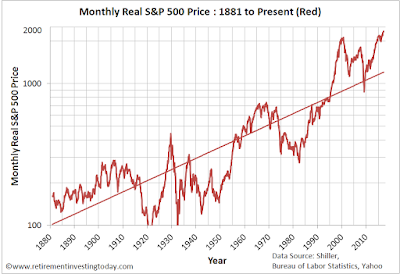 The more obvious events will likely be the continual bull and bear markets that have occurred in the past and I wouldn’t bet on not occurring in the future. Filter the noise by correcting for the continual devaluation of money via inflation then plot on a log chart and they’re clear to see for both the US and the UK. 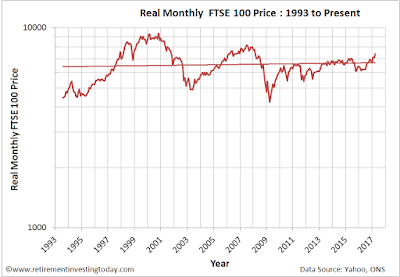 I’m not old enough to have invested through all the FTSE100 cycles shown and I’m certainly not old enough to have invested through all the S&P 500 (or it’s predecessors) cycles that are visible. Instead I started investing seriously in late 2007 so my early days saw the global financial crisis but I’ve then been able to ride that bull wave. 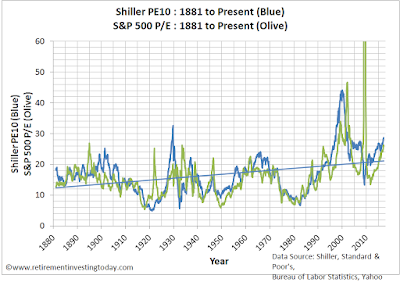 Today that bull wave has resulted in valuations such as the Price Earnings Ratio (P/E) or even the Cyclically Adjusted Price Earnings Ratio (CAPE) looking high compared to history. 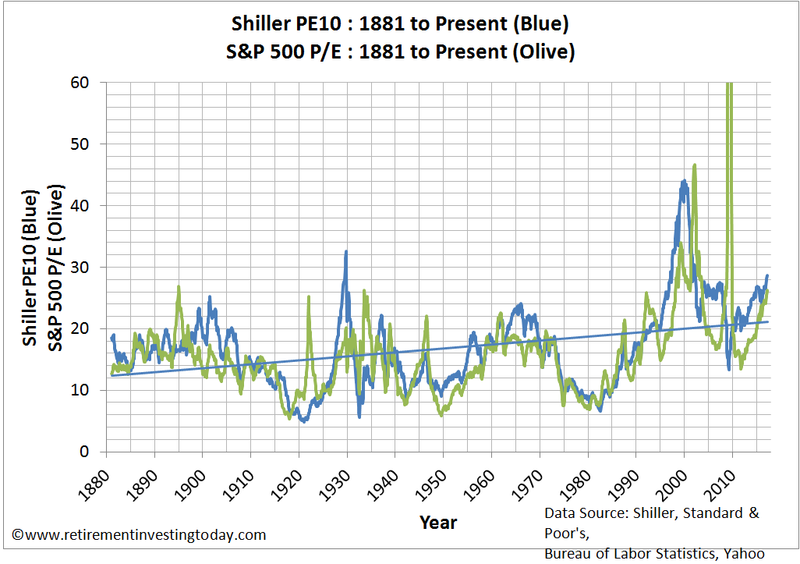 The P/E for the S&P 500 is 26.3 against a long run average of 16.0 and the CAPE is 28.7 against a long run average of 16.7. 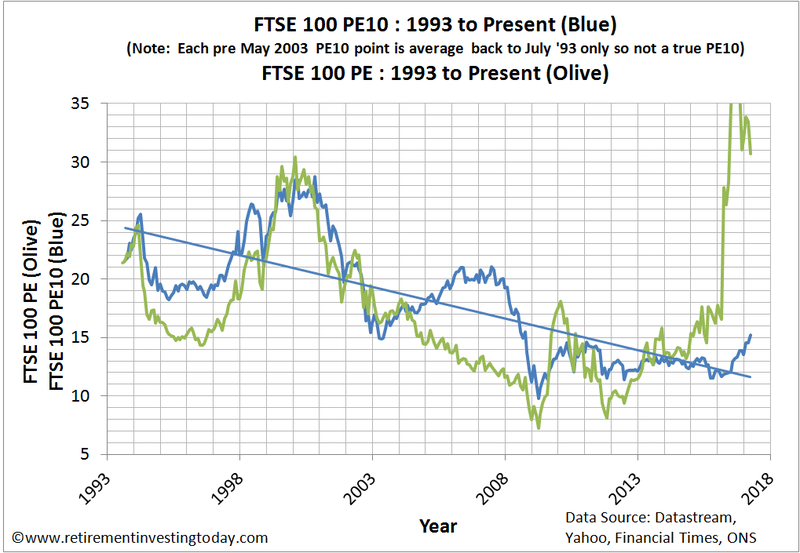 The FTSE 100 is in a slightly different state, albeit measured against a data set with a different duration. It’s P/E today is a silly 30.7 against a long run average of 17.2 while the CAPE is 15.2 against a long run average of 18.0. These valuations have excited the talking heads with both Merryn Somerset Webb and Ken Fisher now starting to talk about valuations. 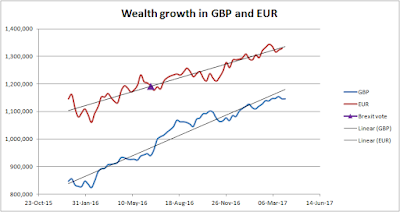 The benefit of just keeping your head down, ignoring the noise and carrying on was also brought home to me this week as I was looking at my historical wealth priced in EUR’s. It’s no secret that the Brexit vote significantly devalued GBP when measured against the EUR. In amongst all that noise I didn’t panic and just stuck at it resulting in my EUR wealth increasing by EUR137k since the Brexit vote. That wealth increase has enabled my Mediterranean plan to become even less risky than it was all because of my approach. Keep calm and carry on certainly seems to be working for me. 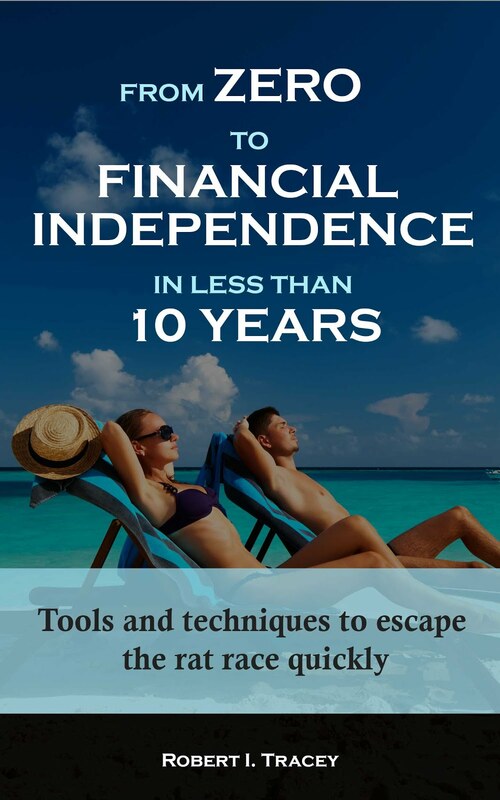 "Carry on" is likelier to suit someone investing every month, especially someone with earning power in the job market, than someone who has retired and is keen to invest so that he, or more likely his widow, doesn't suffer poverty in old Old Age. I'm looking forward to reading about your experiences in retirement, assuming I live long enough. I'm not sure I agree with that dearieme but I'm also not there yet so we'll see how that works psychologically. 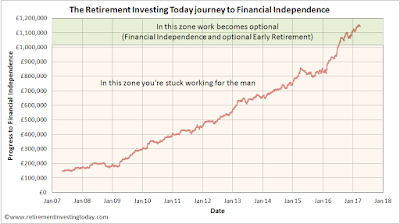 If you don't hold the line and just rebalance (maybe even by selling the out performing asset classes to live off and by continuing to reinvest any spare dividends in the under performers) both your risk profile will change with time and you also risk under performance by being out of the market at the wrong times, trading expenses etc. 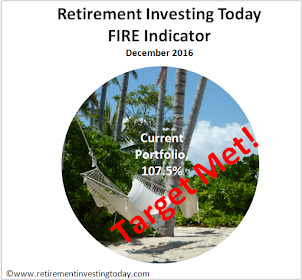 What would I care about underperformance? It's not a competition. 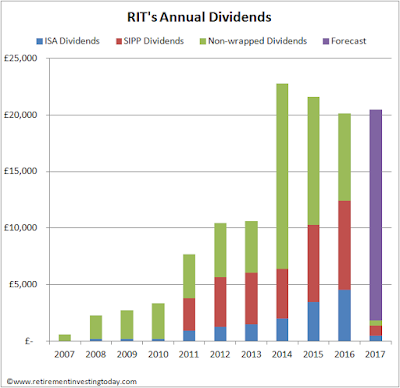 what the hell happened to your dividends between 2013 and 2014! My last offshore active fund, which I can't sell for tax reasons, decided in both 2014 and to a lesser extent in 2015 to pay a huge amount of 'unsustainable' dividends. There was never an explanation as to why but it wasn't great from my side as I just paid tax on them. 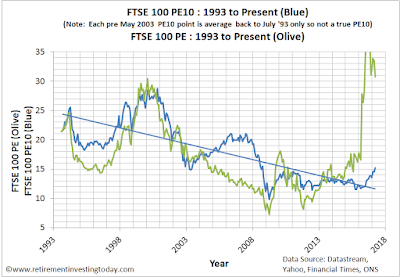 While I wouldn't disagree that US stocks are materially overvalued, I don't believe that's true of UK ones. 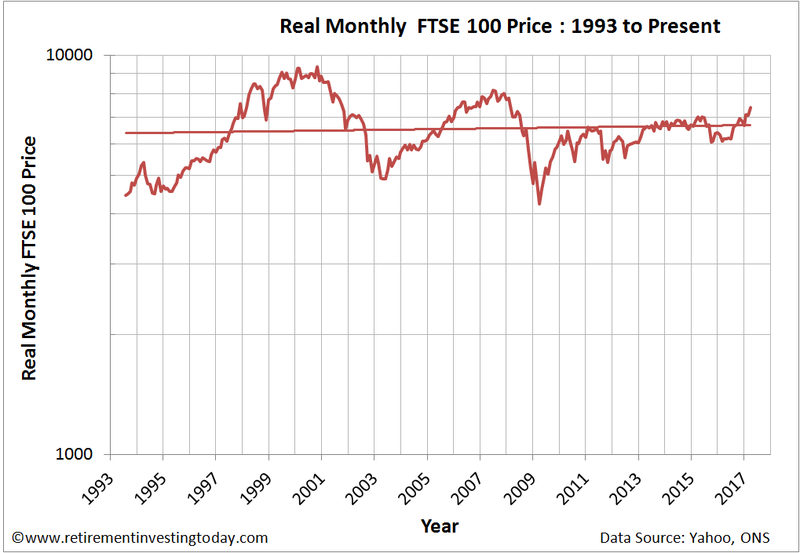 The high P/E ratio of the FTSE100 is skewed by the huge falls in profits in energy and other resources firms resulting from the decline in commodity prices last year and some resulting impairment charges. CAPE, which takes a multi-year view, suggests that our domestic market may be modestly underpriced compared with the long-run average. Keep calm and carry on! That's my plan!. Good to see that it is coming along well. :) Very impressive dividend income! 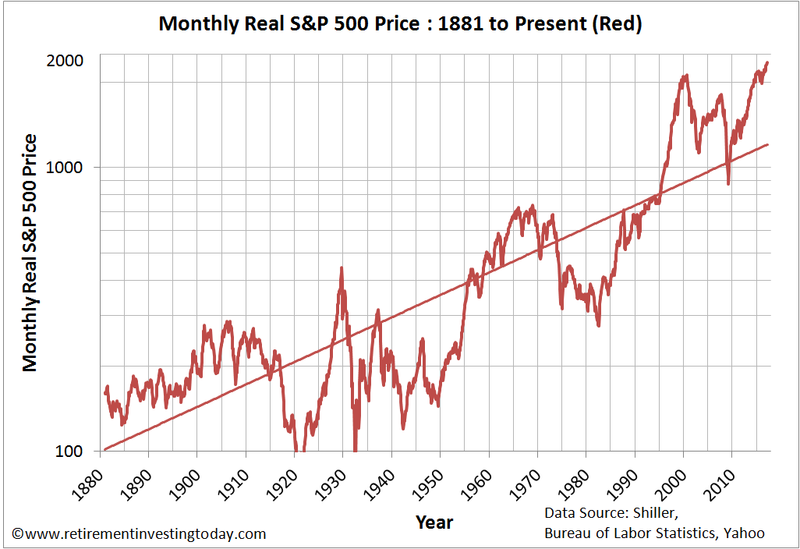 The S&P 500 only started in 1957 but your graph shows it since 1880. Yes, the western markets are all looking fairly richly valued right now. For some diversification you might want to consider: Russia (P/E 9), Vietnam (P/E 13), Brazil (14), and Argentina (can't find the PE but I know it's currently cheap).